Bluefield State College received a B.
Washington Monthly's ranking of 86 out of 346 of Baccalaureate Colleges - Overall Rank was a major contributor to this grade. At this historically African American college in south central West Virginia, students have the opportunity to earn an associate's degree with all credits applicable to a later bachelor's degree. Passing rates among the nursing students here are among the best - and often the highest - in the state. What are the top 3 reasons someone should attend Bluefield State College? What is a typical Bluefield State College student like? Describe the type of person that should attend Bluefield State College. The typical Bluefield state student is hardworking and outgoing.. Here at Bluefield state is some of the most friendliest people you'd ever meet. Alot of students here are family oriented so its like we are all a big family. To serve the racially segregated public schools in the coal camps, progressive citizens of both races worked together to establish Bluefield Colored Institute, a ?high graded school for Negroes,? in 1895. The institution thereafter evolved into a black teacher's college, adopting formal teacher training in 1909 and was renamed ?Bluefield State Teachers College? in 1931. The name ?Bluefield State College? was adopted in 1943, reflecting a growth in the number and diversity of the institution's academic programs. Bluefield State College was integrated after 1954. By the 1960s, the College had a comprehensive four year program of teacher education, arts and sciences, and engineering technology. Gradually, a variety of two year technical programs evolved in response to local needs. 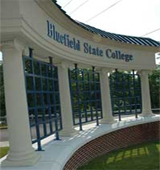 Bluefield State College has emerged as a four year state supported college with a primary academic emphasis in professional and technical programs. The liberal arts offerings of the College are designed to enhance its unique mission. What are the top 3 things that students do for fun at Bluefield State College? We have an outstanding athletic division. I personally enjoy attending the basketball games.. We also have a poetry club and a open mic cafe that I enjoy as well. The average student pays $11,227 for tuition, fees, and other expenses, after grants and scholarships. Total stated tuition is $5,564, in-state and on-campus, before financial aid. Learn more about financial aid at http://www.bluefieldstate.edu/index.php?option=com_flexicontent&view=items&cid=192&id=1304&itemid=395. Estimate the net price for you at http://bluefieldstate.studentaidcalculator.com/survey.aspx. Bluefield State College participates in the NCAA Division II for college athletics. What date does fall semester start? Here is a link to the 2014/2015 academic calendar. Classes begin Monday, August 18.